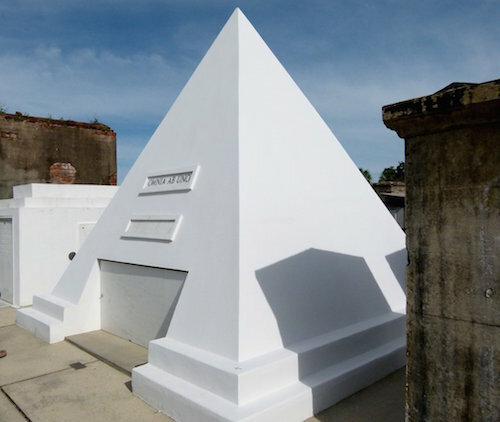 Recognize this pyramid-looking grave? Know where it is located? It is huge and seems quite out of place in this historic cemetery. I was told that locals don’t much care for it, thinking it too grand and ostentatious. A hint: The man who paid for it is not dead yet. He just wanted it to be ready for when he departs this world. This quiz is a Big Toughie. It’s certainly not a Big Easy. Don’t look at the answer below until you’ve formulated your own response. Congratulations if you are correct. Treat yourself to a Sazerac cocktail. If not, might be time to plan a trip to the Big Easy, as New Orleans is known. You’ll have to pay a tour guide to take you through the late 1700s Cemetery No. 1 near the French Quarter. 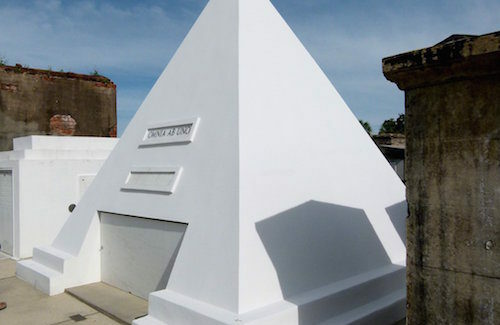 Vandalism in the famous burial ground was such a problem that licensed tour guides now have to accompany visitors and keep a close watch for any mischief, such as that seen in the movie “Easy Rider,” which was partially filmed in the cemetery.